It’s only fitting that today as I am in New York City at a friend’s home and I open up the New York Times, ‘The Week in Review’ has a column titled “The Best Kids’ Books Ever“! If you go to the columnist’s blog, On The Ground, you can see what he lists as the best Kid’s Books Ever which include, The Hardy Boys (my son and husband agree), Harry Potter, and the less known Freddy the Pig series (loved him so much I have bought the re-releases of some of them-can’t get my own kids interested). If you go to his blog, you can see the 900+ comments by readers sharing their opinion about the Best Kid’s Book Ever. Besty and Tacy books by Maud Hart Lovelace (illustrated by favorite childhood illustrator Lois Lenski-which leads me to Strawberry Girl and all books by Lois Lenski-I can even picture where in the library they were located during my childhood and how I kept searching in case there was a title I missed-not very likely as she died when I was five years old, but maybe the library would buy a new-to-me book!). One of my all-time favorite childhood books has a title that alludes me to great frustration. I can tell you where it was in the library, the gist of the book, and how when I went to check it out for the 23rd time, I was devastated that the library had “weeded” it out of their collection. Maybe you know the title from your childhood. There was a family (I think of many boys) that took in an orphaned girl during the Revolutionary or Civil War. One brother (I want to say his name was something like Lamont) loved her secretly, left for war and returned to find her engaged to his brother who had not been gone for the war. I know that is not much of a gist, but still to this day I am bothered by not knowing the title of the book and my inability to read it one more time. What are your favorites? Please feel free to comment and leave titles-I’m hoping for a new Best Book I Have Not Read. One of the last events I managed before becoming a house-selling fanatic, was a trip to my favorite book store Cover to Cover with two of my fourth grade colleagues. Neither had been there before ( I love taking newbies!) and both had some end of the year money to spend on their classroom libraries (Can there be any better type of money to spend?). A combination that can’t be beat in my mind, especially when followed by lunch at Northstar Cafe. Another was to find picture books to supplement their science and social studies topics. I have to say we successfully did both after many fun hours looking through books and exclaiming over finds to each other. I also had the privilege of selecting books that will be given to teachers as part of our August Writing Institute. I’ll include a list of titles I picked up within the next week. I’m sitting in my beautiful backyard writing this post, enjoying the things I love most about it back here-dogs sleeping on cool bricks at my feet, luscious red strawberries growing in raised beds, kids swinging high enough to touch the clouds, a breeze blows the leaves of the surrounding trees and woods, music from the televsision show Grey’s Anatomy plays in the background, and a cold beverage drips a ring on the table. I realize that I have missed the reflective component of blogging over the last couple weeks. It forces me to slow down and think about how the day, week, book, etc. and I haven’t slowed down enough to read or blog since entering house mania. Now that the main preparation sprint is winding down, I hope to be back to blogging almost every day. Next week holds a curriculum mapping week of planning using Primary Units of Study by Lucy Calkins, Talking, Drawing and Writing by Horn and Giacobbe, and Reading With Meaning by Debbie Miller to plan out next year. Should be pretty fun stuff! Then a couple weeks off before heading to Teachers College (TCRWP) Reading Institute July 6th-10th. I’m pretty excited about my haul! 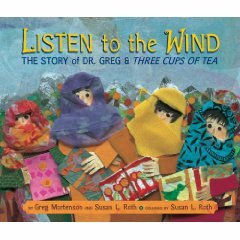 Greg Mortenson of Three Cups of Tea, has a new picture book coming out based on his experiences in Pakistan. He is one of many authors that NCTE has had in their line up. Listen to the Windis a beautiful picture book that is done in collage by Susan L. Roth. The book starts with the children of Korphe, Pakistan and is told from their point of view. They describe the stranger’s, who becomes know as Dr. Greg, arrival and time in the village. After being told by the village’s wisest man to “Listen to the Wind”, and realized that the village needed a school and that he needed to help them have one. I love how the story is told from the point of view of the children and how the village all works together to help build the school. In the end of the book, his new project that he talked about at NCTE, Pennies for Peace, is mentioned. I think that this book is a must-have for schools to include in their libraries and would fit in very well to a multicultural study or character education focus.